Dennis Cogan, described as "relentless and brilliant" says the case was one of his toughtest. By George Anastasia. Inquirer Staff Writer. It's hard to declare victory when your client is found guilty of all 137 counts he faced, but attorney Dennis J. Cogan said the 55-month sentence imposed on his client Vince Fumo Tuesday was the next best thing. Cogan, one of the city's top criminal defense lawyers, said it wasn't about winning or losing at that point. The prosecution had already won. What it was about, Cogan said, was "justice." And though others may rant and rave that the prison term imposed by Judge Ronald L. Buckwalter was inappropriately light, Cogan said it was consistent with the facts of the case. Throughout the five-month trial, even when it appeared the defense was getting "buried," he said, he and other members of the defense team tried to keep the bigger picture in mind. "It was important for the judge to hear the evidence, all the evidence, and not just in terms of the government's case," Cogan said yesterday as he tried to get his legal practice back in order after spending more than a year working almost exclusively on the Fumo defense. While unable to convince a jury of his client's innocence, Cogan said he believed that he and Edwin Jacobs Jr., who represented codefendant Ruth Arnao, had shown the judge that the charges and allegations were sometimes less than they seemed. That point, he said, was underscored in many of the 250 letters written to Buckwalter in Fumo's behalf before Tuesday's sentencing. One former federal prosecutor, Cogan said, likened many of the charges to "a series of misdemeanors," a point that the defense tried to make throughout the trial. Whether, in fact, that kind of argument carried weight with the judge is almost impossible to determine. Fumo's critics, and there are many, say the politically powerful former state senator simply lucked out when he drew Buckwalter as his trial judge. The avuncular former prosecutor from Lancaster County has a reputation as a lenient sentencer, particularly in nonviolent cases. 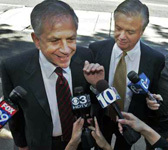 Fumo was just as lucky, others say, when he picked Cogan as his trial lawyer. Not the original choice - he entered after Fumo had a falling-out with Richard Sprague, a longtime friend whom he had tapped to represent him - Cogan has built a career around his reputation for tenacity and intelligence. A Temple University Law School graduate and former assistant district attorney, Cogan is equally at home in front of a jury and drafting a complex legal brief. His storied list of clients during a 30-year career as a defense lawyer includes mobsters, drug dealers, murder suspects, and white-collar criminals. Cogan was raised around Oxford Circle and is a graduate of Northeast High School. He is a lifelong Phillies fan but is uncomfortable talking about his personal life. He is married but would not disclose his age. "It's bad for business," said Cogan, who was one of the top homicide prosecutors for the District Attorney's Office in the 1970s before switching to a criminal-defense practice in 1976. Ask anyone in the legal community for a list of the top 10 criminal trial lawyers in the city and Cogan will invariably be at or near the top. Compile a list of some of the more sensational cases and Cogan will be among the attorneys for the defense. The Fumo case, Cogan said yesterday, was one of the "most exhausting" he had ever tried, and given the choice, he would probably not do it again. The complex nature of the charges, the political overtones, and the publicity - which he referred to as "toxic" - made the case one of his most difficult and time-consuming. The legal issues were challenging, but he has been there before. Cogan pointed to his representation of James Drayton, a notorious West Philadelphia drug dealer and suspected murderer, as another case that had him fighting not just the charges but the prosecution's tactics. Cogan won two acquittals and had a third case thrown out while defending Drayton against a series of drug-dealing and murder allegations. In an interview with the New York Times in 2004, Cogan talked about how police and the District Attorney's Office had played fast and loose with the rules, forcing delay after delay while trying to establish a racketeering charge against Drayton that a judge had already ruled did not apply. "This is not about the opinion of the cops that my client may have done something wrong, and therefore it didn't matter whether they got it right," the article quoted Cogan as saying. "Process does matter." Making it work for all the people. That's what Cogan has built his reputation around, say those who know and have worked with him. In one of his most famous cases, he handled the appeal of convicted mob hit man Neil Ferber, having the case overturned after showing that police had arrested the wrong man and then winning a jury-awarded $4.5 million civil suit for Ferber, who had spent nearly four years in jail, including a harrowing 14 months on death row. Cogan also defended Myla Friedman in a sensational murder case in which the young law school student was charged with murdering her married boyfriend. She was convicted of third-degree murder in a nonjury trial and sentenced to six years in jail. Another longtime client is Joseph Vito Mastronardo, the so-called gentleman gambler and son-in-law of the late Mayor Frank Rizzo. Three years ago, Cogan negotiated a plea deal for Mastronardo. In exchange for a misdemeanor gambling charge and no jail time, Mastronardo agreed to give up any claim to about $2.7 million that Delaware County authorities had seized in an investigation of a high-tech online bookmaking operation he allegedly headed. "Some things are more important than money," Cogan said at the time, amid reports that the deal also included the prosecution's promise not to level charges against Mastronardo's parents, sister, wife, and adult son. Family was also part of the Fumo case, although not all of the involvement was positive. Fumo's estrangement from his elder daughter and the appearance of her husband as a key prosecution witness helped lend an almost soap-opera-like backstory to the prosecution. And at sentencing, Fumo's fiancee and his younger daughter made emotional pleas for mercy. In assessing the case yesterday, Cogan said at times he felt as if there were "two trials," one inside the courtroom and the other outside. The publicity was devastating in shaping public opinion, he said. "I'm not taking shots at the daily reporters," he said, "but the headlines and the columnists were over the top." And then, he said, there were the bloggers. "Bloggers are nuts," he said. "They don't understand anything." Cogan said he believed Fumo's political enemies had engineered some of the blogs to fan the flames that continue now over Buckwalter's sentence. "This was such a high-profile case, and in the Internet era, with Facebook and Twitter, you can start a revolution, as we know from Iran." Cogan said all of those issues had contributed to what he likened to the "perfect storm" in which Fumo was swept away. Buckwalter's sentence, he said, brought the case back into its proper perspective. And friends of Cogan's say his defense work was part of the reason that happened. "He's both relentless and brilliant," said Christopher Warren, a defense lawyer who has worked with Cogan and who said he is always amazed by Cogan's uncanny ability to "see what the reasonable position is" and build his legal arguments around it. Those in the defense camp continue to insist that the prosecution built its case in part around hyperbole and rhetoric. Cogan, they argue, countered with logic, facts, evidence, and compassion. Those who accept that assessment acknowledge that it wasn't enough to win an acquittal. But they, like Cogan, said it had resulted in justice. And for a defense attorney, that's the next best thing.